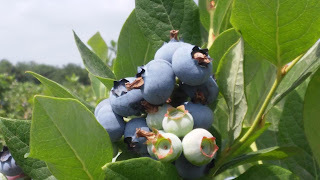 So for most families, Father's Day is synonymous with barbecues and picnics, but in the Haegele household it's the BLUEBERRY FARM. Yes, last Sunday meant a nice drive through the back roads of New Jersey... destination Vaccarella's Farm. They're a father and son business much like Haegele's bakery. 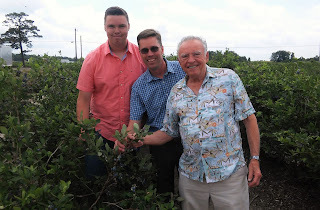 Though we didn't pick the blueberries ourselves, the ones we purchased were just being packed, which means they were in the hands of their pickers just the day before. From bush to bushel to bakery in just a weekend! Hence with a commitment to using the finest and freshest ingredients, all things blueberry are making their way into our store. From blueberry muffins, blueberry shortcake, to fresh blueberry crumb pies, New Jersey's finest bushels are debuting on our shelves. Perhaps getting sandy soil in your sandals isn't what you think of when you think of Father's day, but for our family all things come back to the bakery. It's our livelihood, it's our life and more importantly, it's our family!